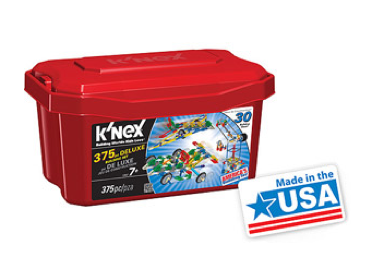 K’NEX 375 Piece Deluxe Value Tub Only $11 + FREE Store Pick Up (Reg. $19.97)! You are here: Home / Great Deals / K’NEX 375 Piece Deluxe Value Tub Only $11 + FREE Store Pick Up (Reg. $19.97)! This would make for an awesome Christmas gift!! Hurry and snag this fun K’NEX 375 Piece Deluxe Value Tub for only $11 + FREE Shipping (Reg. $19.97) with Site-to-Store!